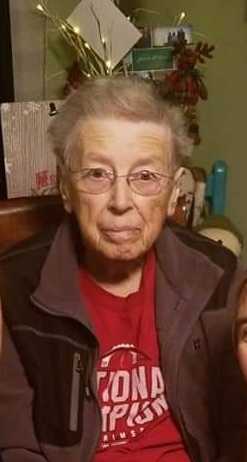 Wilma Louise Flowers, age 85, of Argyle, Florida passed away Sunday, April 7, 2019 in DeFuniak Springs, Florida. She was born the day after Christmas in 1933 in Bloomington, Illinois to Wilmer and Julia Jasmand Diedrich. All her life, she loved to square dance and her husband Louie enjoyed dancing with her. Wilma’s favorite college was Alabama! She was an enthusiastic supporter of the Crimson Tide. It made no difference if the team was on the football field or the basketball court, she pulled whole heartedly for them. She is preceded in death by her parents, Wilmer and Julia Diedrich ; one daughter, Teresa Nelson; and step-mother, Mary Alice Diedrich. Wilma is survived by her husband of 44 years, Louie T. Flowers; daughter, Denise Hembach and husband Joel of Eagle River, Alaska; brother, Harold “Bud” Diedrich of Monticello, Illinoise; grandchildren: Chris Hembach of Eagle River, Alaska, Erica and Cole Muzzana of Oak Harbor, Washington, Crystal and Tommy Robbins of Savannah, Georgia, Bridgett and Al Ortega of Argyle, Florida, Shawna and Brian McCrory of Ponce de Leon, Florida; nine great-grandchildren; and numerous family members residing in Illinois and Connecticut. Funeral services will be held Friday, April 12, 2019 in the chapel of Davis-Watkins Funeral Home,1474 Highway 83 North, DeFuniak Springs, Florida 32433 beginning at 1:00 p.m. with Reverend Scot Keppel officiating. A time of visitation will be held one hour prior. Committal services will follow in Ward-Wilson Cemetery in Dothan, Alabama.